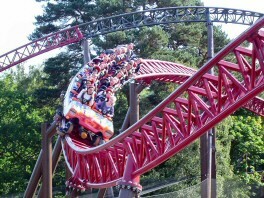 In July 2004, word started to spread that a new roller coaster would appear in Ug Land for 2005. Initially penned in for a June 2005 opening, the date was pushed forward to April in a daring move by the park. This gave them a time scale of less than a year from drawing board to finished ride. Early on it was confirmed that the ride would be a launched coaster from Intamin. From October 2004, Ug Land was closed to allow the site workers to start construction, which meant that Corkscrew was not accessible to the public at that time. When you enter Ug Land, the first thing you'll notice is just how much Rita dominates the area's skyline. The entrance to the queue line is a giant half-tyre, and depending on the length of the queue, you may find yourself winding around a cattle-pen style queue line underneath Rita. As you get closer to the station, the queue line passes underneath the launch track, which builds the tension as it shudders above you. Upon reaching the station, you can choose to join the front row queue, but this can add up to 30 minutes to your overall queue time. Once it's your turn to board, you step across the somewhat awkward cars and sit down. The minute or so while you wait for the train to be ready to launch passes excruciatingly slowly. Then, the voice-over starts talking about tension mounting, as the car slowly rolls slightly forwards, and then slightly back. The voice-over shouts "go, go, GO!" as the lights turn green. All of a sudden you're hurtling towards the first sweeping turn, wondering where you left your breath and stomach behind. The launch is incredibly forceful, and you're still a bit dazed by it all when the train reaches the summit of the first air-time hill. You drop back down, flying over people in the queue lines. Back up again, and over the second air-time hill, which then takes you back down to the inside of the first turn. You follow it around, before branching off and going over another hill, and up into the first set of brakes. The train then rolls slowly around the final turn. You hit the second set of brakes and reach the off-load platform. Rita may be a bit too short, but following the launch, there are at least a few air-time opportunities. A great head-rush.